Garmin has expanded its range of nüvi portable satnav products with two new models, including one with an FM transmitter that enables you to hear voice instructions, phone calls and MP3s through your car stereo. 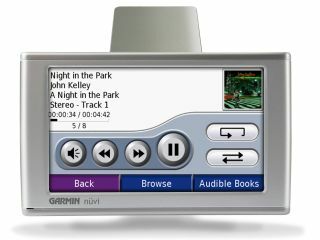 The model with the added functionality is the nüvi 670 which also includes pre-loaded maps for over 30 European countries as well as the USA, Canada and Puerto Rico. It also has the ability to store up to 200 MP3 audio tracks on its 1.2GB of spare memory, and includes Bluetooth so you can make and take calls hands-free using a compatible mobile phone. It also has an SD card slot so you can add more maps (at extra cost) should you need them. The 670 is joined by the cheaper, but less functional, 370 which lacks the FM transmitter. Both nüvis comes with advanced satellite navigation features, says the company, including a traffic warning system that warns you about upcoming jams and helps you plot an alternative route. They also ship with safety camera data - free for the first three months - giving you plenty of warning about when to slow down to avoid a fine in the UK and other countries. Both of the new units go on sale in February. The 670 is priced at £499; the 370 at £379.